HMH Books for Young Readers, 9780152049430, 32pp. Ella love-love-loves her brand-new umbrella. It's sky blue with white clouds, and it makes the most satisfying whoosh . . . click sound. Rain or shine, Ella insists on taking it with her everywhere. Unfortunately, a whoosh-clicking umbrella can cause serious trouble . . . especially at a ballet recital. It's a good thing Ella is a problem solver, because she's going to need to be creative to get what she wants. 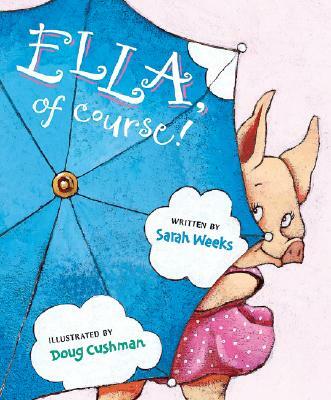 Sarah Weeks and Doug Cushman deliver a hilarious and universal tale about a little girl's trouble letting go of a favorite object. SARAH WEEKS is an extremely well-known award-winning author of numerous picture books and middle grade novels, including Who's Under That Hat? and Ruff! Ruff! Where's Scruff?, both created with David A. Carter, and her own So B. It. She lives in New York City.